Found this blog explaining what "A Serious Man" was about and after reading the review, I felt the blog authors opinion made me better understand what the movie was about. This Coen Brothers film is a very mature adaption on if you choose to allow your life to be on autopilot, eventually you will suffer (e.g. morally, physically). After the movie was over, I sat and tried to reflect on what this movie was about and struggled with the meaning. 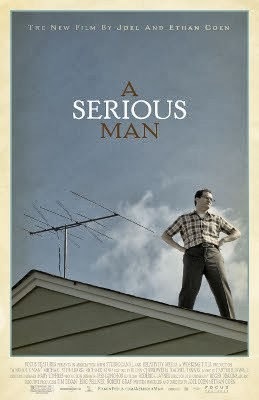 Even though this is not one of my favorite Coen Brothers films, I appreciate the complex depiction of philosophy, faith and life. The movie can be a bit slow, but that is only because the director's wanted the audience to understand the neuroses of the protagonist. Please watch the movie and then enjoy this blog post.